The vehicle hit Mr McLean with such force that he was found 30 metres away from his bicycle. The driver did not stop after the accident, which happened near the junction with Winns Terrace. 48 hours later the police have still not put up a sign at the site of the collision asking for potential eye-witnesses to get in touch with them. Over 4,000 people a year are injured by 'hit and run' drivers in London. The sad reality is that the drivers failure to stop is part of a well established pattern of behaviour in London, with over eighty people a week being injured in collisions involving hit and run drivers." "London has halved the number of traffic police in the last twelve years and as a result we live in a city where many drivers expect to break the rules and get away with it. We need a clampdown on road tax and insurance evasion, and we need the police to take these offences seriously again." ...is on Erskine Road E17, close to the junction with High Street. 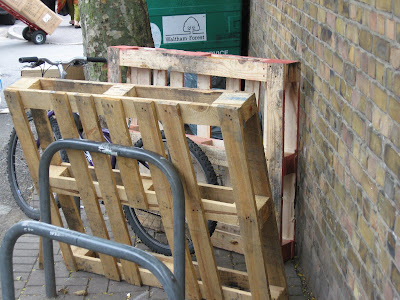 These wooden pallets were undoubtedly dumped there by a market trader. Remember the photos I took at this spot last Sunday? 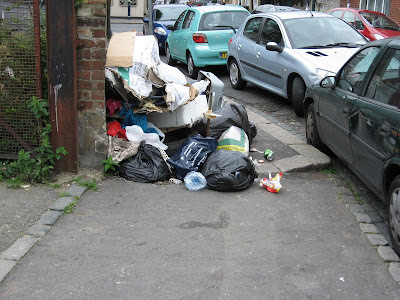 The good news is that the rubbish was removed and as you can see, four days later there is… fresh rubbish blocking the footway! 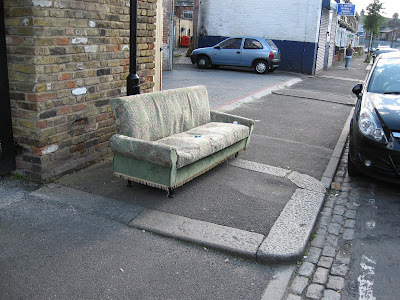 The pavements of Waltham Forest - where the term 'street furniture' takes on a whole new dimension of meaning. First example: Poplars Road E17, two days ago. Second example: Howard Road E17, today (looking towards Church Hill). A complete bed, in pieces. I wonder if they have crap like this in Sutton or Croydon? As it was a bank holiday today, the car in the above photo is parked perfectly legally. 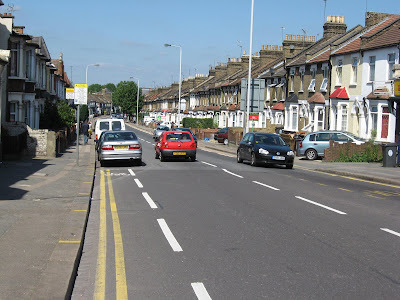 This photo shows a change to the cycle lane in Forest Road E17, just after The Bell corner, heading towards inner London. Until very recently the cycle lane hugged the kerb. Now, parking bays have been introduced and cyclists are diverted out into the centre of the carriageway. My guess is that the Council did this in response to the problem of illegal parking at this point. There's a fish and chip shop here which attracts a lot of trade from drivers who think nothing of parking on a yellow line and obstructing a cycle lane. One solution would have been to build out the footway and narrow the carriageway, making it physically impossible to park, while leaving a route through the footway extension for cyclists. 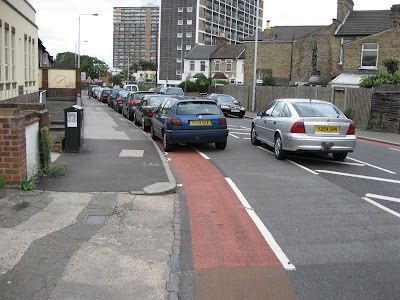 Instead, the Council has chosen to accomodate the parkers and divert the cycle lane. My objections to this diversion of the route are twofold. Firstly, the design is self-evident crap. No driver should ever be able to block the cycle lane in this way. It would have been easy enough to incorporate a physical impediment preventing obstruction of the kind shown in my photographs. But an even greater problem at this location is speed. Huge numbers of drivers break the speed limit on this section of Forest Road. 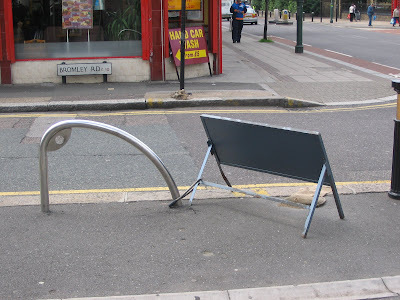 The only realistic way of curbing this is to put in speed cameras (as has been done on parts of Lea Bridge Road, which remains a deadly road for cyclists and pedestrians). It is quite unacceptable to expect cyclists to divert into the centre of the carriageway at a site where drivers are flagrantly breaking the speed limit. I shall not be unduly surprised if one day I open the local paper and read that a cyclist has been knocked down and killed by a reckless, speeding driver at this very location. Look, it's not as if I go looking for this kind of thing. It's just that I come across it all the time. 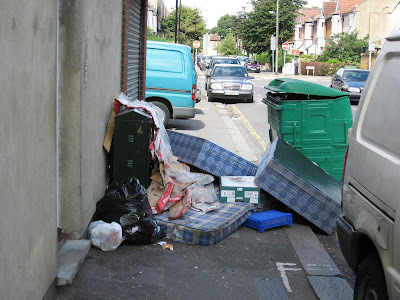 On a sunny bank holiday Monday this was the situation on Carisbrooke Road E17 (High Street end). 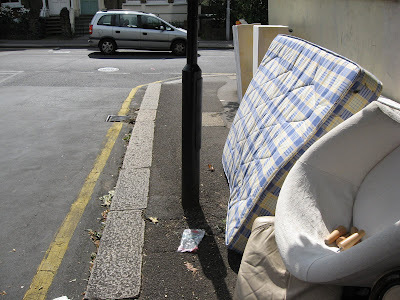 A flytipped bed, mingled with refuse that might just have something to do with a nearby business. And the footway completely obstructed. 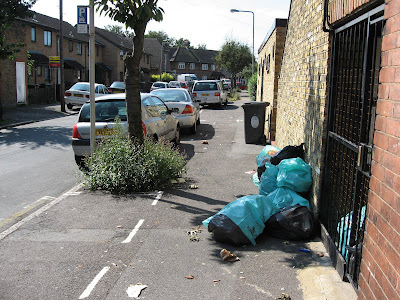 And look beyond the rubbish to see just how comprehensive the degradation of the walking environment is. 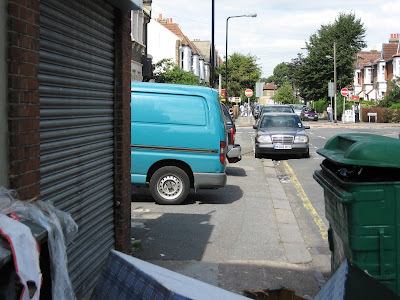 Firstly, the crap council introduced pavement parking on a street which once never had it. And you will see in the photo below that the owners of the van and the 4-wheel drive beyond it have parked their vehicles in a driveway which is too short for their vehicles. More than 50 per cent of the footway is obstructed. The Council has the power to deal with obstructions of this kind but chooses not to exercise it. Well, done, Waltham Forest! But then with all the garbage dumped alongside them you wouldn't really want to, would you? 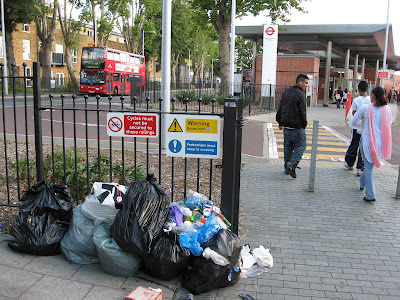 This was the main High Street entrance to Walthamstow bus station this afternoon. Two of those sacks are official LBWF trade refuse sacks, so my guess is that all this rubbish has been dumped by a local trader. All LBWF residents have recently received a stern letter from Councillor Bob Belam, Cabinet Member for Environment, anouncing that recycling will be compulsory as from 10 September, with fines of up to £1,000 for those who don't recycle. Fair enough. 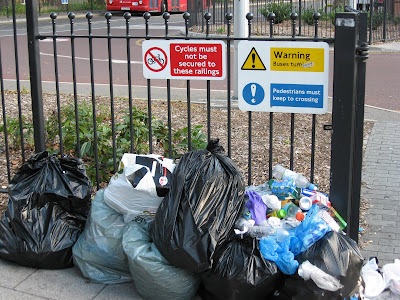 And mass recycling will "continue to make Waltham Forest a greener and cleaner place to live." Message to Bob. You have some way to go. And my impression is that the filthiest people around the Borough are not residents but businesses. Take Livingstone Road E17, for example. 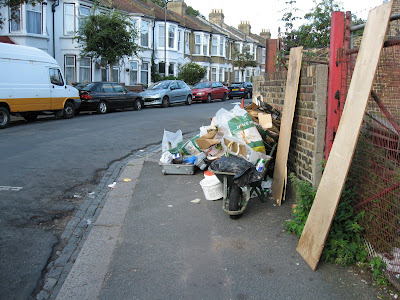 For as long as I can remember the pavement has been regularly obstructed here by trade refuse. This was the situation on Livingstone Road close to the junction with Hoe Street this afternoon. 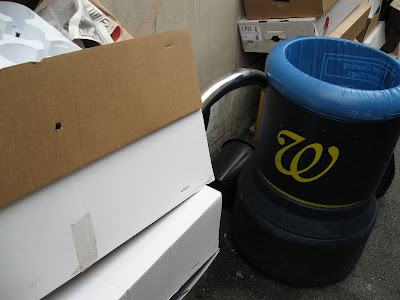 This particular refuse is building trade rubbish. How many businesses is the Council prosecuting for doing this, I wonder? The Crooked Billet underpass is a labyrinth of cycle lanes and footways designed to keep cyclists and pedestrians away from the A406 North Circular. The price you pay for using an inferior transport mode to driving is to be forced down into the underworld. Now as underpasses go these ones are fairly wide and well-lit, and there are usually other cyclists and pedestrians around when I use this site. However, although cycling is generally on the increase in the Borough recent figures showed a decline in cyclists using the Crooked Billet. This may or may not be to do with the fact that muggings and assaults occur here from time to time. Needless to say I've never once encountered bobbies on the beat in this fairly intimidating location. Notice the arrow on the road surface beside the car directing drivers towards... the cycle lane! Notice the complete lack of protection given to cyclists as they join an A road where drivers are belting round a blind corner at speed. It is even worse at the other side (below), where cyclists emerge from Chingford in the direction of the Monoux sixth form college. Here, two lanes of fast moving traffic merge into one at the same point where the cycle lane enters from the right. Again, a blind corner, fast traffic, and no physical protection for cyclists at all. 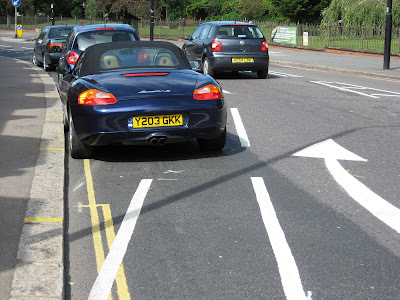 Incidentally, the contractors who did the resurfacing never bothered to reinstate the double-yellow line - another symptom of a crap Council not in control of its officers. 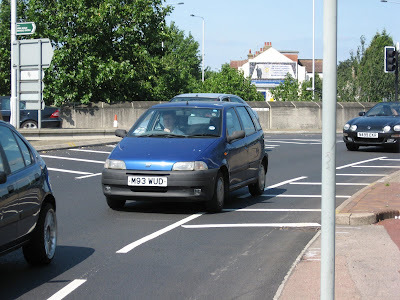 (Above) The blue car strays into the cycle lane in response to the vehicle to its rear. And (below) the flash black sporty saloon car drifts into the cycle lane at the very point where cyclists enter the A road. A recipe for a cycling fatality, if ever there was one. The situation here replicates that in numerous other sites across Greater London and is a common source of complaint from cycling bloggers. The cycle lane on a fast moving A road terminates abruptly in a parking bay. The parked car is legally parked. A cyclist is forced out into the middle of the road and has to hope that the traffic behind will brake and not kill her. 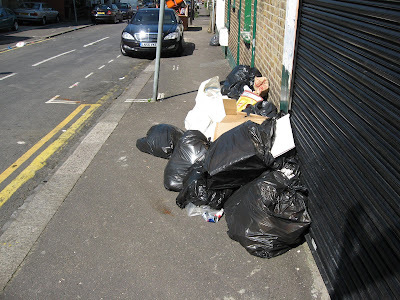 (Above) Sacks of rubbish alongside the commercial premises on Hawthorne Road E17 at the junction with Hoe Street. 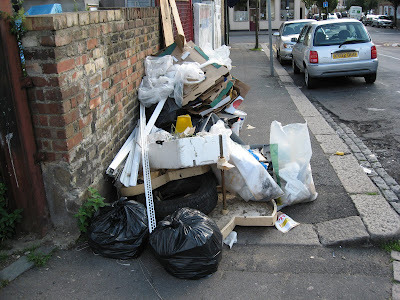 (Above) Rubbish in official Council trade refuse bags on the pavement at the rear of the hairdressers on Penrhyn Crescent E17 close to the junction with Chingford Road. The area to the left of the white lines is for pavement parking. If someone had parked there you'd struggle to get between them and the rubbish with a motorized wheelchair or a double buggy. But then traditionally once this crap council has handed over large areas of the pavement for pavement parking it loses all interest in what happens to the strip that's left for pedestrians. 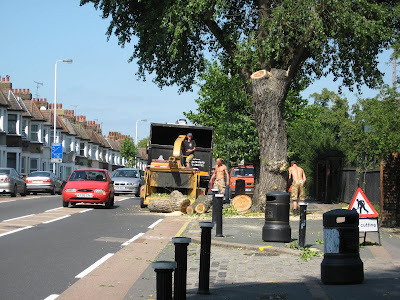 On Chingford Road outside the Monoux sixth form college a team of contractors were cutting down the magnificent mature trees here. This crap council is currently engaged in a tree massacre across the Borough. It hates trees. Trees are unpopular with some residents because they drop aphids on to parked cars. Well, we mustn't have that, must we? The important thing to remember is that car parking always comes before cycle lanes. Cycling is an add-on, not a priority. Parking a ton of metal for as long as you want to is more important than encouraging cycling. 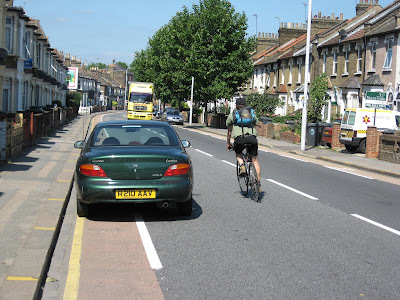 This is why so many cycle lanes across Greater London end abruptly with a parked vehicle. And since there are no yellow lines, the vehicles in these photos are parked lawfully. 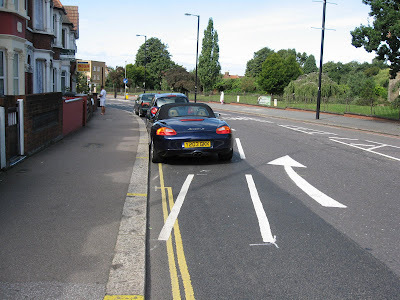 My photos show the cycle lanes on Leyton Green Road, London E10. These lanes are terrifying to use and I prefer to avoid them whenever possible. The traffic moves very fast and there isn't room for two cars to pass if cyclists are using both cycle lanes. 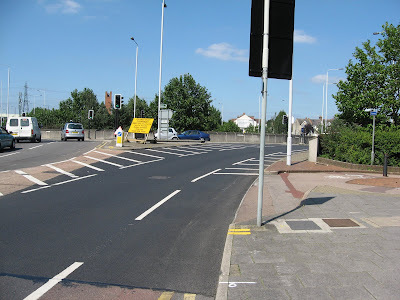 This first photograph shows the cycle lane approaching Lea Bridge Road. As you can see, when a 4 Wheel Drive passes a parked 4 Wheel Drive (one with a grotesque bull bar attached) any vehicle coming the other way is forced into the cycle lane. And a cyclist pulling out to pass the parked 4 Wheel Drive has to rely on the driver behind braking. The situation is even worse going towards Leyton. 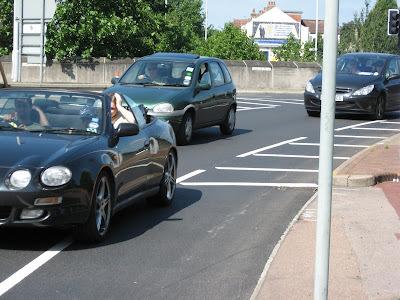 Because of vehicles parked in the cycle lane, drivers are forced into the dashed white line zone in the middle of the carriageway (put there to deter drivers entering it). If you look closely you will see that the black car coming towards the silver car is in the cycle lane - the driver has no choice. The road just isn't wide enough. High speed traffic and badly designed cycle lanes are a recipe for a cycling fatality. I remember some weeks back there was an interesting little story in the weekly local paper, The Waltham Forest Guardian. A cyclist contacted the paper to complain about regular obstruction of cycle stands in the side streets off Walthamstow market. 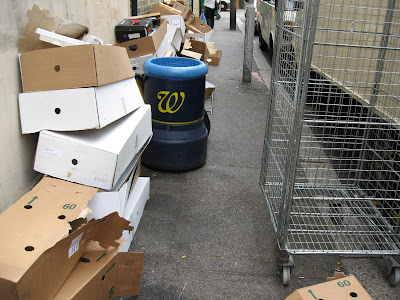 The culprits were local shopkeepers, who blocked them with goods put on the pavement (an offence) and market traders, who dumped rubbish around them (an offence). The newspaper verified that this was indeed happening. 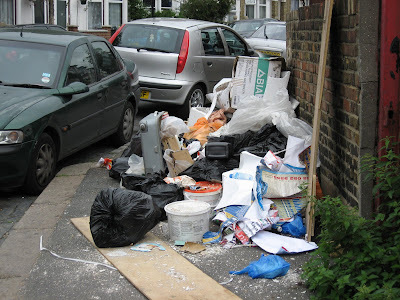 When the paper contacted the Council, a spokesperson said that they were unaware of the problem (why not? – this is a prominent and busy location). However, now that it had been drawn to their attention they would act. Their officers would keep an eye out and deal with any problems that occurred in the future. I’ve lost the cutting and I can’t remember all the streets which were listed. But one of them was Vernon Road E17. And this is what I found when I pedalled there yesterday to do a quick spot of shopping in my lunch hour. There used to be two cycle stands on this side of Vernon Road, close to the junction with the High Street, but now there is only one (the mysterious disappearing cycle stands of the London Borough of Waltham Forest is a separate story which I’ll come to another day). 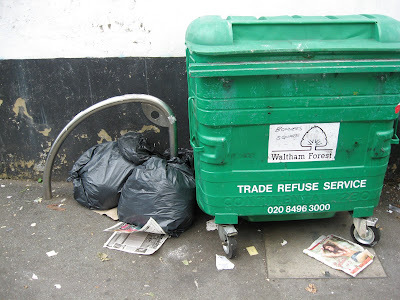 The label on the green commercial waste bin wedged up against the cycle stand identifies it as the one allocated to Bonners by the Town Square. This is curious as Bonners are a fruit & veg outfit at the other end of the market and it clearly has nothing to do with them. My guess is that it is used by the fishmongers on the corner of Vernon Road and the High Street, as it is alongside their premises. Who dumped the two black sacks next to it is anyone’s guess. Two conclusions can be drawn from this, I think. Firstly, whoever is employed by the Council to monitor the condition of these cycle stands should be transferred to other duties and replaced by someone who is prepared to do the job properly. Secondly, the shops and market stallholders responsible for these obstructions should get one strong warning, after which they get prosecuted or their trader’s licence taken away. Mind you, there’s also a third realistic conclusion to be drawn. The Council is crap, it will never deal with the problem, and it will still be wasting its time and money on spurious cycling propaganda and empty Green initiatives when the floodwaters surge down the High Street and a tornado rips the roof off the Town Hall, as a consequence of this crap Council’s unending commitment to car dependency and catastrophic climate change. Bromley Road, E10, London Borough of Waltham Forest, at the junction with Lea Bridge Road. Close to the Bakers Arms junction, this is a very prominent location. This cycle stand (and the footway!) has been obstructed by a local business for over a year now. Some days the sign is right beside the stand. It is padlocked to the stand and so cannot be moved. Look carefully and you will see that the sack of sand used to weigh the sign and stop it blowing over in the wind has split, spilling sand on the footway. 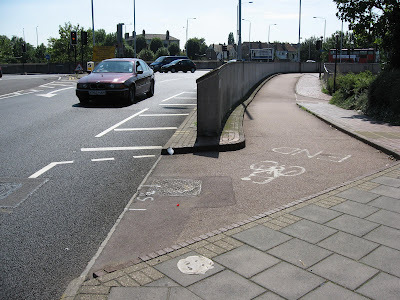 Just one of hundreds of examples of the London Borough of Waltham Forest's failure to look after the interests of cyclists and pedestrians. 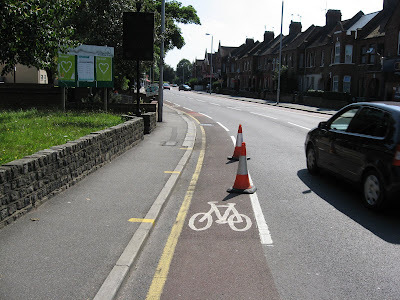 The title and content of this blog, incidentally, is inspired by the Crap Cycle Lanes of Croydon blog. 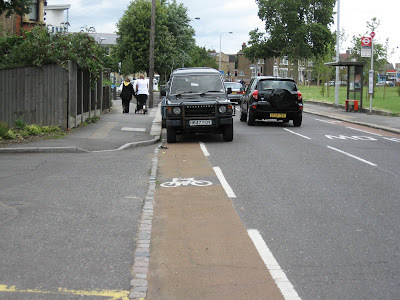 It's time more London cyclists posted blogs showing just how crap London is for cycling in.